"Plenty of affection, creativity, and raucous older ladies to make readers smile." 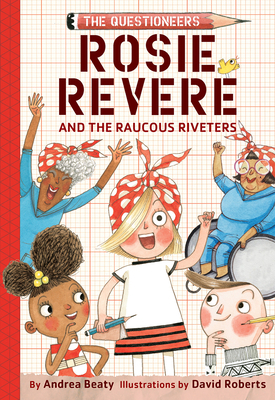 "The duo behind the bestselling STEAM-based picture book series that introduced engineer Rosie Revere, architect Iggy Peck, and scientist Ada Twist turns the kids into a team, “the Questioneers,” in a spirited chapter book series opener." "Rosie places an emphasis on not being afraid of failure, and if she ever gets carried away by excitement or doubt, she must "STOP AND THINK!" The strength of this series is in the positive portrayal of diverse kids engaging in various arts and sciences." "Readers will be engaged throughout this charming fictional story, and enjoy saying the silly sounds while learning about engineers and perseverance."